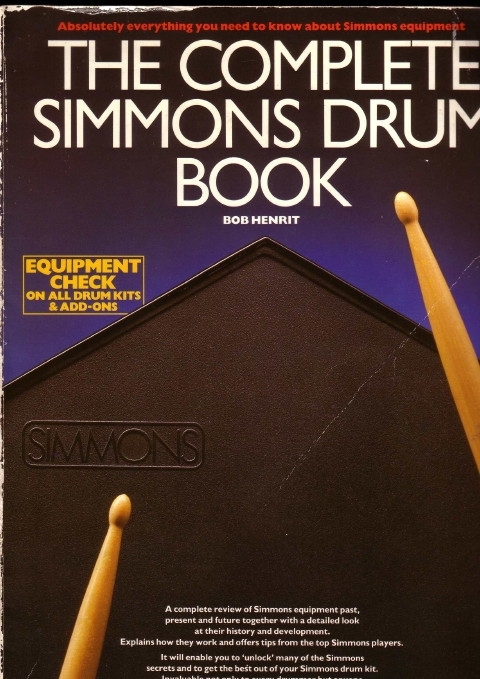 I think it is not exeggarated to say that the Complete Simmons Drum Book is the holy bible for every Simmons fan. Even more since this book is not available anymore. It was written around 1987 by professional drummer/editor/tester Bob Henrit. It tells the full story of Dave Simmons and his Companies “Musicaid” and “Simmons” from the very beginning until the announcement of the SDX. As I am no contemporary witness of this period, I am really glad to possess my very personal copy. It cost something around 50 Euro. Probably today the only source to obtain essential information about at least the first (and better) half of the company’s history. To get to the heart of this post: I really wanted to provide a PDF version on my site for free, but a book is more than a catalogue or an advertisement and I did not want to hurt anybody’s rights. So I contacted the auther Bob Henrit to discuss the idea of making it puplic domain. Unfortunately he was aversed to this idea what I absolutely respected. He preferred the idea to distribute it with a required fee. But my policy is to keep my site non-commercial, so I refused. In my opinion a fee would have reduced the number of readers (and the expected sales) to a very minimum. The only thing I can tell is if you have the chance to get your hands on a copy: Take it. It was expensive, but is still worth every cent. Promised. This entry was posted on Thursday, October 22nd, 2009 at 7:44 pm and is filed under Misc, Recommendation, Report, Stories and Gossip. You can follow any responses to this entry through the RSS 2.0 feed. Both comments and pings are currently closed.